Klorane Shampoo with Desert Date washes away dirt, excess oil and product buildup without stripping essential moisture to leave you hair feeling soft, supple and revitalized. Desert date extract repairs damage caused by environmental exposure, chemical treatments and heat styling. Wheat proteins smooth and restructure uneven cuticle fibers and restore lustrous shine to your locks. 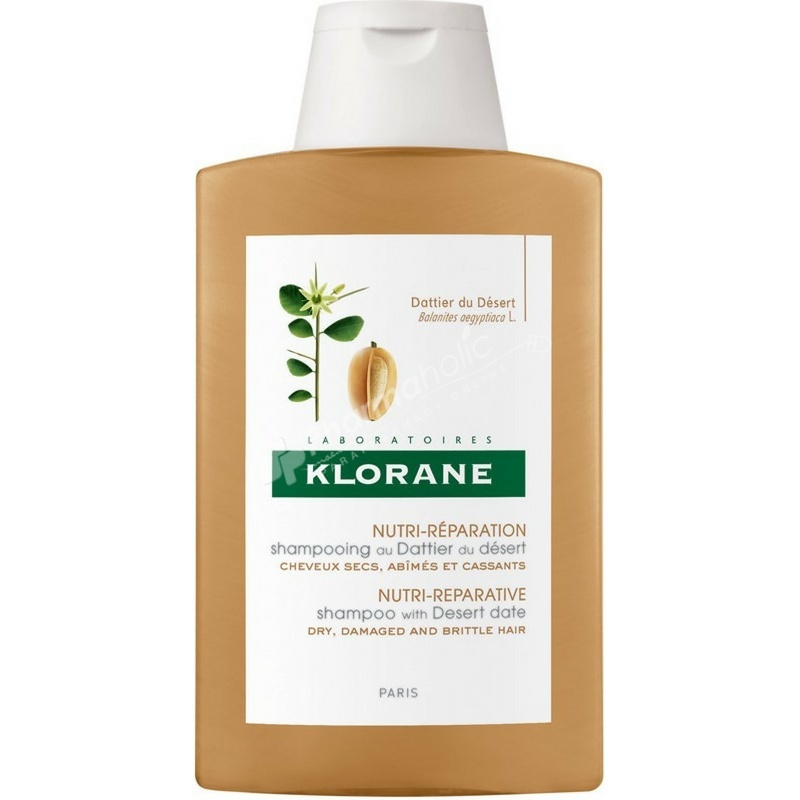 For dry, damaged and brittle hair, the Klorane Shampoo with Desert Date provides to the core of hair fiber the elements it requires for its resistance and nutrition. With a subtle pearly color, this shampoo offers a generous and pleasantly scented foam. Repairs, restores and strengthens hair. Recommended for dry, brittle and damaged hair. Apply to wet hair. Work into a lather and then rinse. In case of contact with eyes rinse thoroughly. Water (Aqua), Sodium Laureth Sulfate, PEG-7 Glyceryl Cocoate, Olive Oil Glycereth-8 Esters, Sodium Lauroyl Methyl Isethionate, Lauryl Betaine, Glycol Distearate, Decyl Glucoside, Balanites Aegyptiaca Seed Extract, Benzoic Acid, Caramel, Citric Acid, Cocamide Mea, Disodium EDTA, Fragrance (Parfum), Hydrolyzed Wheat Protein, Laureth-10, Limonene, Maltodextrin, Polyquaternium-10, Sodium Benzoate, Sodium Chloride, Tocopherol, Yellow 6 (Cl 15985).